A film documenting efforts to balance environmental sustainability in the Cinque Terre amid rising tourism and recent natural disaster. 76 backers pledged $5,400 to help bring this project to life. FIRST GOAL REACHED, HELP US ACHIEVE THE FINAL GOAL!!! THANK YOU TO EVERYONE WHO HELPED US REACH AND EXCEED OUR INITIAL GOAL OF $2600!!! WE ARE STILL SHORT ONE PLANE TICKET AND EQUIPMENT RENTALS. HELP US REACH OUR FULLY FUNDED RETURN COST OF $4500!!! NEW AWARD LEVEL OFFERS A TERRIFIC DEAL ON THE FOUR-NIGHT STAY AT A BEAUTIFUL TUSCAN BED AND BREAKFAST! (DONATION LEVEL $1250, ACTUAL VALUE IS $1400!!!) REDEEM ANY TIME FOR A STAY BETWEEN APRIL AND AUGUST IN 2012 OR 2013!! A film documenting the Cinque Terre of Italy's struggle for sustainable eco-tourism in the face of political corruption and environmental disaster. In 2008, we embarked on a journey to document the remarkable efforts for sustainable ecology, environmental and historical preservation, and eco-tourism in the Cinque Terre of Italy. We wrapped filming in September 2010 and returned home to begin editing. Then, two weeks later, a sudden turn of events changed everything. Politics, corruption, greed, and an unexpected environmental disaster last October of 2011, which largely destroyed two of the five villages, now threaten the landscape of this beautiful Mediterranean coastline. Our film at first explored the creative endeavors undertaken by the Cinque Terre National Park to preserve culture and agricultural heritage within this UNESCO World Heritage site, while still welcoming three million tourists every year. Today, the film explores the Cinque Terre's now unstable future, and the story is being continually shaped by ongoing massive restoration efforts and the tug of war over precious territory and a heritage thousands of years old. Everything is about to change in the Cinque Terre, but no one knows how. You can help us to find out. You can help us tell the story. The film has been self-funded thus-far, with a talented crew working for little or nothing, volunteering countless hours of time and talent because they believed in the story. Now you can help to finish this film, to give the residents of the Cinque Terre a voice, and hopefully help them share with the world what they need to move forward in the direction they desire. Our initial Kickstarter campaign was set at a financial goal to fully complete the film, all the way through to the finishing stages of audio post production and music licensing. The goal was unreached, and so we've established a new plan: raise just the funds enabling us to return to Italy, and we'll figure out the rest when we get back. The established goal of $2600, combined with our own limited financial resources, would cover MOST of the bare-bones essentials to allow us to return. But according to our budget, if you can help us reach an actual goal of $4500, we can secure not only the lodging, transportation, and airfare, but also have the necessary funds to gas up the car at the current $8/gallon, feed us three squares a day, and rent our gear. If you can help us exceed the goal by more than that, we are able to secure all the equipment rentals to ensure better audio quality, hire a translator an extra day or two, and possibly even secure at some of the post production costs, including audio post production, music, and film festival submission fees so we can get the story out there. About four years ago we started on a crazy journey to complete a feature documentary film in a country where we don't live, in a language we don't speak, and with money we didn't have. Along the way, we just figured it out. $4500 will get us through the final filming stage of this journey, and if you help us get there or exceed that, by however much possible, we promise we'll figure it out from there again. Donations start at just $8, but the bigger your donation, the bigger your reward! All donations include your name listed on our website, and in some cases, the film credits, showing exactly what you funded... a gallon of gas in the rental car, one day's lodging, a train ticket.... see our donation levels and notice that they have been matched to reflect our actual needs and costs. The future of the film is in your hands. We need you. **A note about the "Est. Delivery" date underneath all of the rewards - Kickstarter requires that you put the latest expected delivery date for ALL rewards listed in each package - since we are including a DVD of the film in most of the packages, we can't promise delivery of that until we finish the film and get it shown at a premiere! But most of the other rewards are things that can be sent out relatively quickly after the Kickstarter campaign ends. Why $8? Because that's the current price of gas per gallon in Italy as of this writing. You just helped us up into the hills behind the villages to shoot some of the vineyards or recent construction, a trip which will require our rental car. Thank you!!! At this level, we'll include your name with a special thank you on our website and we'll also send you a thank you "Vendemmia" postcard! You just covered the approximate cost of a one day regional "Cinque Terre Rail Card," at the current exchange rate, which will allow one of us to travel between the five villages for a day. We'll include a special thank you in the film credits, and also on our website, Facebook, and Twitter. And we'll send you a thank you "Vendemmia" postcardl! Why $58? That's the exact cost of our rental car for the day, at the current exchange rate. The car will allow us to reach the terrain and vineyards behind the villages, essential locations for us to film. As a show of our appreciation, we'll send you a SPECIAL EDITION DVD of the film, which includes "behind the scenes" features and additional footage of the Cinque Terre. In addition, we'll include a thank you in the film credits, on the website, facebook and twitter, AND, at this level, you will receive personal behind the scenes updates. The special edition DVD is more than two thirds this value, so think of it as a DVD pre-sale with a little extra donation added! We'll also include a handwritten, commemorative notecard printed with our movie poster image. Grazie, grazie!!! The nightly rate on our locally rented apartment is 75 Euros a night... which at the current exchange comes to about $101. THANK YOU for giving us a place to sleep, and for contributing to the local Cinque Terre economy!! In addition to the Special Edition DVD of the film, a thank you in the film credits, on the website, facebook and twitter, a limited edition poster signed by the directors and select key players featured in the film, we'll also include a 30 MINUTE SKYPE Q&A WITH THE DIRECTORS! Ask us all your burning questions about the amazing Cinque Terre or the intricacies of DSLR video shooting - you might be surprised to find out how you can take that camera you've got at home and turn it into an instrument for your own filmmaking! Let us tell you everything we've learned.... and believe me, we've learned a lot! The special edition DVD is nearly a third this donation value, so think of it as a pre-sale purchase with the extra bonus of a one-on-one session with the directors and an extra donation. **Estimated delivery date below refers to the Special Edition DVD - the 30 minute Skype Q&A will be available to schedule within three months of our Kickstarter campaign conclusion. Did you know that anchovies are caught in the Cinque Terre at night using a night fishing light, or "lampara"? Our beautiful and talented set photographer, Uta Theile, knows all about the art of fishing firsthand, since she is married to one of the last anchovy fishermen in the Cinque Terre. At this very special level, in addition to the Special Edition DVD of the film (this time, signed by the directors! ), a thank you in the film credits, on the website, facebook and twitter, you will receive a SIGNED COPY of Uta's gorgeous book, “L'Arte della Pesca - Un Viaggio nelle Pesca delle Cinque Terre”. 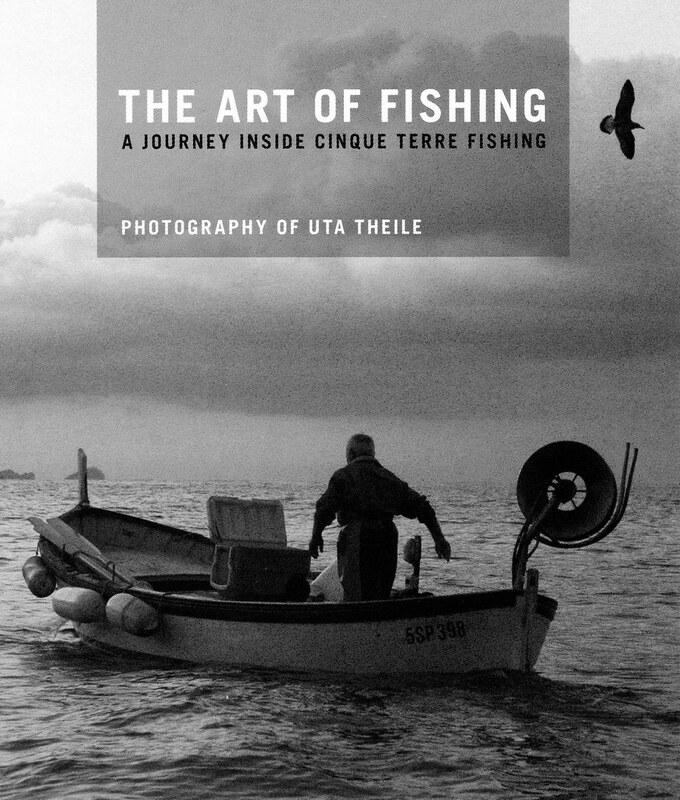 This amazing book is filled with stunning photographs and written documentation of the mysteries and beauty of the art of fishing, and has become an integral part in raising awareness for the Cinque Terre in the wake of their devastating environmental disaster this past October. Uta is becoming more and more known for her beautiful talents... become one of the few to have a signed copy of her book as your own. The value of the book with the photographer's signature and shipping included is nearly a third of this donation, so think of it as a purchase with one of our night's accommodations and some daily transportation costs added in! **Estimated delivery date below refers to the Special Edition DVD - Uta's book will be shipped within three months of our Kickstarter campaign conclusion. At the current exchange rate, you've just paid for our car rental for the duration of the trip, which, as we've said above, will be necessary to allow us transport for our gear and crew into the vineyards and hillsides of the upper Cinque Terre region. Thank you!!! In addition to the Special Edition DVD of the film signed by the directors, a signed, limited edition movie poster, a thank you in the film credits, on the website, facebook and twitter, and personal behind the scenes updates, at this level we'll send you a special commemorative "Vendemmia" coffee table book on the making of the film. This unique, signed, limited edition book includes behind the scenes set photos, insights from key players on the making of the film, still shots from the film, and spectacular photos of the Cinque Terre. You've done it. You've purchased for us that last airline ticket we needed covered!!! GRAZIE MILLE! And now, we offer to you something so special we can only give it once! Experience the wine and cuisine of Italy for yourself - surrounded by spectacular Tuscan vineyards! In addition to the Special Edition DVD of the film signed by the directors, a limited edition poster signed by the directors and select key players featured in the film, this level gets you a four-night stay for two (airfare not included) in one of the premiere suites at Ortaglia in breathtaking Montepulciano, Italy. Owned and operated by our very own Nicola Biscardo, who appears in the film, this exclusive five-bedroom 15th century villa provides one of the most unique "bed & breakfast" experiences available for visitors in Tuscany. Your voucher for your stay is valid any four nights of your choosing between April and August (subject to room availability.) The package also includes a personal call from the directors to chat with you about the opportunities you may find while experiencing this one-of-a-kind Tuscan experience, and assistance from the directors in booking your stay when you are ready to do so (no rush! whenever you are ready!) The actual value of the stay is GREATER than the donation value by a few hundred dollars, so this is an opportunity you don't want to pass up. Check out our short video on Ortaglia to fully appreciate this remarkable opportunity! **Estimated delivery date below refers to the Special Edition DVD - the voucher for the stay in Ortaglia will be provided within 30 days of the conclusion of the Kickstarter campaign, and the voucher may be redeemed for any four nights of your choosing between April and August.